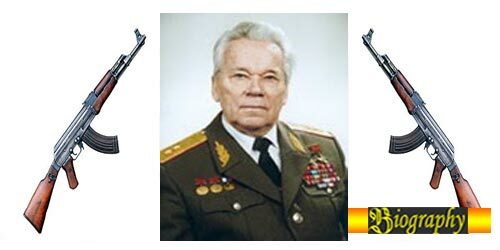 Mikhail Kalashnikov, He is known as the creator or inventor of the AK-47. He was born 10 November 1919 in the village Kurya, the Soviet Union from a poor farming family. At age 19, Kalashnikov conscripted and joined the 24th Tank Regiment, 12th Tank Division where he finished school and became a mechanic tank mechanic-driver tank and reached the rank of senior sergeant (tank commander). On October 1941, in a fierce battle in Bryansk, Kalashnikov was badly injured and had to be hospitalized. While in the hospital this time he had the idea to design a submachine gun. Kalashnikov ability as a designer invite attention. He had worked at the Moscow Aviation Institute. Beginning in 1942, the Kalashnikov worked at the Central Research Small Arms Range of the Main Ordnance Directorate of the Red Army. At the same time, the Soviet Army is interested in developing an effective assault rifle is short M1943 round. The first weapon presented by Sudayev in 1944, but the trial turned out to be the weapon was too heavy. A new design competition was held two years later where Kalashnikov and design teams participating in the competition. For several years Kalashnikov continue to work to realize the design by improving and combining various elements of automatic weapons and assault rifles that had been there at the time. The first innovation is the use of short bullet 7.62 × 39 mm. "It's small and compact," said Paul Cornish, curator of weapons at the Imperial War Museum, London, England. Gas option can also be used as a driving force of this weapon. Gas can be recycled into the piston and is used for charging the next bullet. So the weapons work on the same principle as rifle mesin.Kedua it, plus a very simple design is the genius of the Kalashnikov. Until then in 1947 was born rifle AK-47 (Avtomat Kalashnikova stands for the model 1947). In 1949, AK-47 became the standard rifle of the Soviet Red Army. During the Cold War, the AK-47 (Kalashnikov generation and the next, AKM) is used by communist soldiers worldwide. The Soviets also distributed weapons to militant groups and left-wing guerrillas who support the Soviet interests. Until now AK-47 became the most popular weapons in the world. An estimated 100 million AK-47s in circulation around the world. However, Kalashnikov said he did not earn money from this, only income comes from pensions. Kalashnikov has created a weapon with a simple design, easily mass-produced, easy to use even by poorly trained soldiers without losing the ability to turn off. These properties make the AK-47 into a reliable and effective weapon for the paramilitary and the city warfare. My aim creating an AK-47 is to defend my homeland. Not my fault if the Kalashnikov became famous in the world and is used in areas of conflict. Is to blame is the policy of these countries is not the designer weapon. He also said that he did not know how there can be a creation of weapons in the hands of terrorists. He is proud of his work even though he admitted that he would be happy if he could make a machine that can help farmers, for example a lawnmower. On December 23, 2013, Mikhail Kalashnikov died at a hospital in Izhevsk, the capital of Udmurtia republic where he lives, Kalashnikov had been hospitalized for the past month with health problems is unknown.